A federal jury has found JOSEPH MALDONADO-PASSAGE, also known as Joseph Allen Maldonado, Joseph Allen Schreibvogel, and “Joe Exotic,” 56, formerly of Wynnewood, Oklahoma, guilty on two counts of hiring someone to murder a woman in Florida, eight counts of violating the Lacey Act for falsifying wildlife records, and nine counts of violating the Endangered Species Act, announced First Assistant U.S. Attorney Robert J. Troester. 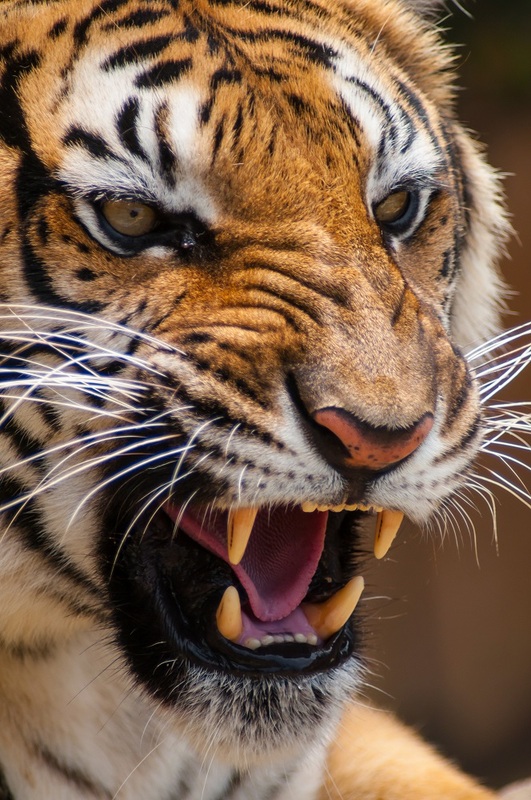 A tiger roaring showing off its powerful jaw and giant teeth. Will these be traits carried into the future? On September 5, 2018, a federal grand jury returned an indictment that accused Maldonado-Passage of hiring an unnamed person in November 2017 to murder “Jane Doe” in Florida and also hiring a person who turned out to be an undercover FBI agent to commit that murder. A superseding indictment handed down on November 7, 2018, further alleged Maldonado-Passage falsified forms involving the sale of wildlife in interstate commerce, killed five tigers in October 2017 to make room for cage space for other big cats, and sold and offered to sell tiger cubs in interstate commerce. Because tigers are an endangered species, these alleged killings and sales violated the Endangered Species Act. During a trial that began on March 25, a jury heard evidence that Maldonado-Passage gave Allen Glover $3,000 to travel from Oklahoma to South Carolina and then to Florida to murder Carole Baskin, with a promise to pay thousands more after the deed. Baskin, a critic of Maldonado-Passage’s animal park, owns a tiger refuge in Florida and had secured a million-dollar judgment against Maldonado-Passage’s park. The evidence further showed that beginning in July 2016, Maldonado-Passage repeatedly sought someone to murder Baskin in exchange for money, which led to his meeting with an undercover FBI agent on December 8, 2017. The jury heard a recording of his meeting with the agent to discuss details of the planned murder. In addition to the murder-for-hire counts, the trial included evidence of violations of the Lacey Act, which makes it a crime to falsify records of wildlife transactions in interstate commerce. According to these counts, Maldonado-Passage designated on delivery forms and Certificates of Veterinary Inspection that tigers, lions, and a baby lemur were being donated to the recipient or transported for exhibition only, when he knew they were being sold in interstate commerce. Finally, the jury heard evidence that Maldonado-Passage personally shot and killed five tigers in October 2017, without a veterinarian present and in violation of the Endangered Species Act. After only a few hours of deliberation, the jury returned guilty verdicts on both murder-for-hire counts, eight Lacey Act counts, and nine Endangered Species Act counts. At sentencing, Maldonado-Passage could be imprisoned on each murder-for-hire count up to ten years. He would also be subject to up to three years of supervised release and a fine of up to $250,000 per count. Each Lacey Act violation could carry a prison term of five years, a fine of $250,000, and three years of supervised release. Each Endangered Species Act count could result in one year in prison, a fine of $100,000, and one year of supervised release. Maldonado-Passage will remain in the custody of the U.S. Marshals Service pending sentencing, which will take place in approximately ninety days. This case is the result of an investigation by the U.S. Fish and Wildlife Service Office of Law Enforcement, the Federal Bureau of Investigation, and the Oklahoma Department of Wildlife Conservation, with assistance from the U.S. Marshals Service. Assistant U.S. Attorneys Amanda Green and Charles W. Brown are prosecuting the case.